Part airship, part helicopter, part plane, the 300-feet long aircraft is about 50 feet longer than the world's biggest passenger planes. The aircraft's maiden flight was originally scheduled for Sunday, but was postponed due to a technical problem. 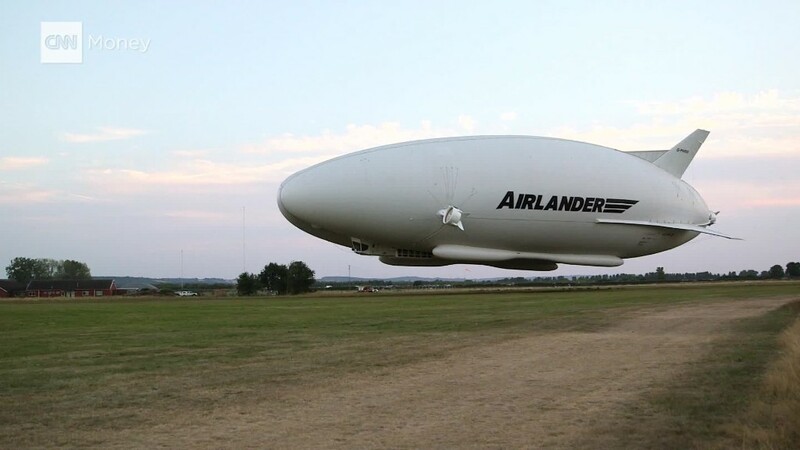 The Airlander, made by British company Hybrid Air Vehicles, has four engines and no internal structure. It maintains its shape thanks to the pressure of the 38,000 cubic meters of helium inside its hull, which is made from ultralight carbon fiber. The Airlander has a significantly lower carbon footprint than other forms of air transportation, and the team behind it hopes it will be used in a wide range of commercial jobs. They said the aircraft could carry communications equipment or other cargo, undertake search and rescue operations, or do military and commercial survey work. The Airlander can stay airborne for up to five days at a time if manned, and for more than two weeks if unmanned. It can carry up to 10 tons of cargo at a maximum speed of 91 miles per hour. The aircraft doesn't need a runway to take off, meaning it can operate from land, snow, ice, desert and even open water. -- Barry Neild and Lauren Said-Moorhouse contributed reporting.